We wish you all of the best as we close out 2013 and launch a new year. We hope you take time to reflect on the best things that happened during the past months, and plan to make 2014 even better. And, we hope the new year brings plenty of opportunity for adventure. New Years Day is a big play day in Utah and we invite you to join the fun. The weather should be great - with seasonally mild temperatures all around the state. Our ski resorts will be open and conditions will be great. Also consider snowmobiling, cross country skiing and other snow adventures. Hiking and biking conditions are superb in southern Utah right now. In Moab, the temperature tomorrow should hit 38 F, with plenty of sunshine. In the St. George/Zion area the temperature is expected to climb to 58 F. The golf courses will be busy, as will the hiking trails. All of our national parks, national monuments and national recreation areas will be open, although some visitor centers will be closed. Many of our state parks will also be open. We welcome 2014 and the adventures it will bring. We hope to meet you on our ski runs, backcountry trails and community streets. Many people will hit some of the major events and then sneak away to a favorite restaurant or bar for a less public celebration. Many other parties are also available. Salt Lake Weekly has this good rundown for the Salt Lake scene. Below we give the headline and teaser. Wherever you choose to party, we hope you have a safe and enjoyable evening. In some communities transportation may be available for people who choose to drink and don't want to drive back to their home or hotel. Inquire locally and schedule whatever help you may need. We wish you all the best during the holiday season. 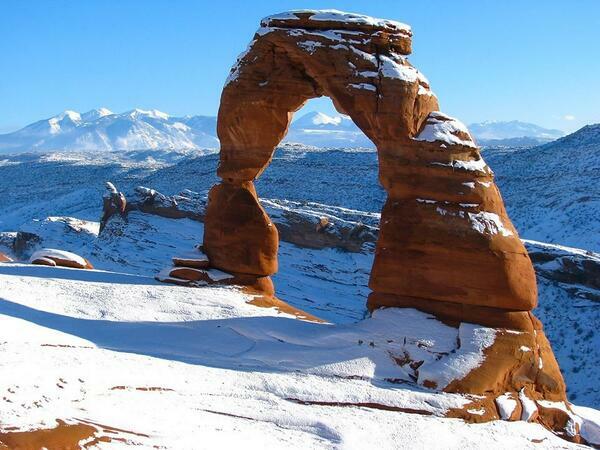 Much of Utah lies under a blanket of white, thanks to widespread snow earlier this week. Now, Christmas Eve has brought clear skies, crisp air and bright stars. On this special evening, all will be quiet and peaceful. Businesses that cater to travelers will be open and hospitable, but most businesses will be closed so employees can spend time with families. Traffic will be very light. On Christmas Day, many businesses will be closed but motels, restaurants, convenience stores, movie theaters and recreational spots will be open. Our national parks are open year-round but visitor centers will be closed. Christmas Day is a popular time to hit the slopes and try out new skies, boards and other equipment. Snow conditions should be excellent and none of our ski resorts will be over-crowded. We're now moving into the prime weeks of Utah's ski season. In our low-elevation desert areas, Christmas Day will bring sunny skies and mild temperatures. In the St. George area, hiking and biking conditions have been good during the past several days. There are no storms in the forecast and so conditions should be excellent from now into the new year. Daytime highs are expected to push into the mid-50s F this weekend. In the Moab area there is still snow on the ground in many places, as you can see from our photo (provided by Arches National Park). The area is warming up, snow is melting and many hiking and biking trails are open. 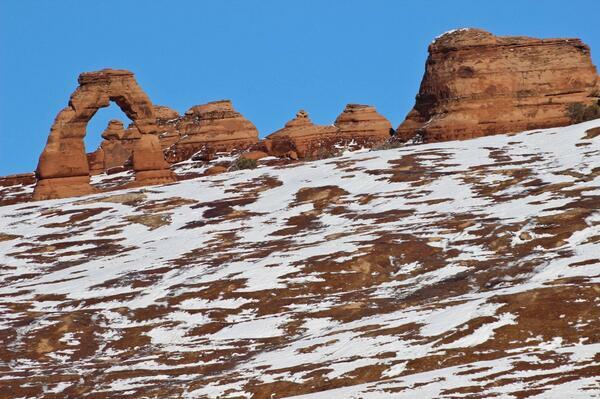 Arches reports that the Delicate Arch Viewpoint is now open after having been closed by heavy snow. Snow against red rock creates a beautiful scene. We hope you take time to enjoy this season - sharing memorable experiences with those you love. Santa can ski for free at Brighton Ski Resort tomorrow, Dec. 24. The first 50 people to show up at the ticket window dressed up as Santa will be given free lift passes. Details. Santa and Mrs. Clause will be seen at many Utah resorts during the next few days. At Deer Valley, Santa will visit guests in the Snow Park Lodge area tomorrow from 9 to 11 a.m., and at the Silver Lake Lodge area tomorrow from noon to 1:30 p.m. Guests and their children are invited to bring a camera and take pictures with Santa. For more information, please call 435-649-1000 or 800-424-DEER (3337). Deer Valley's annual Torchlight Parade will be held on Big Stick ski run on Bald Eagle Mountain, behind Snow Park Lodge. Complimentary hot cider and cookies will be served on the Snow Park Plaza. For more information, please call 435-649-1000 or 800-424-DEER (3337). It's that time of year - time to SKI. Help decide which North American ski destination is the best in this Readers' Choice contest. You have until DEC 30 at NOON to vote, and you can vote once a day. It's snowing right now in northern Utah - the third wave of a series of "disturbances" that continue to drop powder at our famous ski resorts. This morning, Snowbasin reported 15 inches of snow snow. It's now about noon and, undoubtedly, a few more inches have piled up. It will be about 48 F with sunshine in St. George this afternoon. The forecast says the high temp will hit 54 F on Christmas Eve. The next several days will offer perfect conditions for hiking Utah's open desert areas. Should I ski or hike during the coming holiday? Utah's ski resorts can become busy during the Christmas to New Years period. For that and other reasons, I traditionally make a pilgrimage south to the land of red rock and sunshine. It's always a fun trip that helps me maintain perspective and balance as we fall headlong into winter. Gunlock State Park includes a small reservoir popular for boating and fishing. It offers good populations of catfish and bass, which are most active when the water is warm, so few people fish during the winter. The reservoir is located along the Santa Clara River and it offers a refreshing swimming hole for people visiting during the long warm season. Gunlock includes a nice camping area. In years past I'd didn't hesitate to camp even during the dead of winter, but I'm getting old and soft and so now I stay in motels. I hiked in the area a few days ago and took the photos that illustrate this post. There was a skim of ice on one small bay but the main reservoir was totally ice free. There was snow in shady spots and the sand was wet but hiking conditions were still very nice. With warmer, dry weather in the forecast, the remaining snow will be gone soon. I'll return between Christmas and New Years, to explore more backcountry. 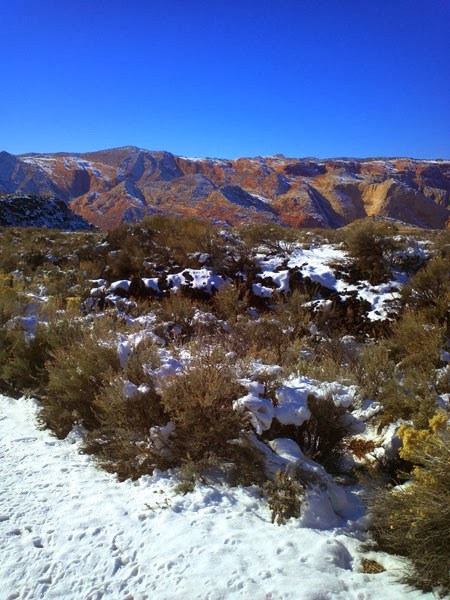 Snow Canyon, just over the ridge, is on of Utah's best winter hiking areas. As I drove by I noticed a van from the Biggest Loser Ranch, which is located in nearby Ivins. Sand Hollow offers a beautiful reservoir and very nice sand dunes. Trails in the area are open for ATV riding, which is very popular right through the winter. Zion National Park offers many low-elevation trails that are inviting during the warm season. There are countless other hiking and biking trails in this part of the state. Freezing rain and snow caused travel problems in northern Utah today while dumping new powder at our ski resorts. Salt Lake International Airport was closed for a time and some flights were canceled or delayed. It is now open. Power remains out in many neighborhoods in northern Utah. Antelope Island State Park was closed today and will probably be closed tomorrow morning Call head if you would like to visit there. This is the Place Heritage Park canceled activities this evening. The Salt Lake airport received 6.7 inches of snow (as of 5 pm, with more falling). That is a new record for this date. All of our ski resorts report new snow, with some receiving a big dump. More snow is expected tonight and then it should let up tomorrow. Another storm is expected to move in Saturday. Watch the KSL.com weather report to stay up to date on weather around Utah. KSL.com also has this report on today's storm and this feature on staying safe while engaging in backcountry recreation. 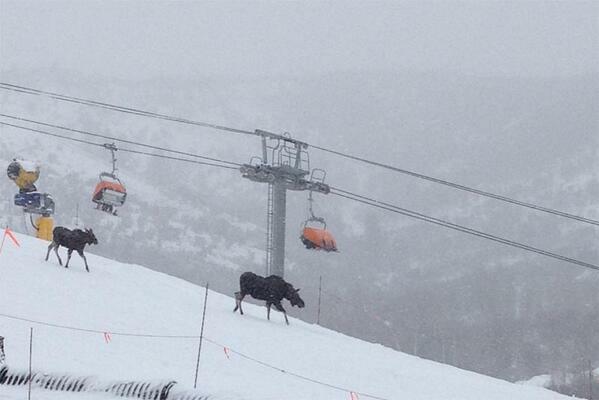 Canyons Resort posted this fun photo on Twitter. Matadornetwork.com has this interesting article about unique opportunities at Utah ski resorts. Below is the title and then highlights. Here's a video showing the Snowbird ski tunnel. There are a couple interesting new articles out that tout the beauty of Utah's national parks and state parks. One focuses on Zion and Bryce Canyon while the other offers a list of great parks where you can escape crowds. Below we give the titles of the articles and then excerpts. It's got Zion, it's got Canyonlands … Utah has so many amazing parks that busy Bryce and the Arches don't even make the cut. Here's our guide for the best places to escape the crowds. Golf is popular year-round in St. George, but it has been difficult to play this week because of record snow and cold. Happily, the weather is finally warming up and the snow is melting quickly from most area courses. Forecasters say the thermometer will rise to 52 F on Tuesday - back to normal conditions for that usually sun-drenched city. “I have never seen anything to this extent,” said Scott Brandt, golf pro at Bloomington Country Club for 22 years. Bloomington, which has been closed since last Friday, usually sees about 75 golfers a day this time of year. We are hoping that we don’t have damage to our irrigation system once the snow melts, Brandt said. While the city courses may not open until early next week, they are hoping to have the driving range at Southgate Golf Club open on Saturday. I would be extremely surprised if we are able to open before next week, Bloomington’s Brandt said. It has been many years since St. George has seen so much snow and such cold temperatures, according to this article, also from StGeorgeUtah.com. Here are more excerpts. NWS Meteorologist Christine Kruse keeps a close eye on weather records in the state of Utah. She said that, while the NWS did not collect any official data from St. George this week, if it really did reach zero, Monday morning would be the coldest it has been in St. George since the all-time record was set at minus 11 degrees in January of 1937. The weekend snowfall set records for the region as well. On Saturday, Zion National Park saw its most intense 24-hour snowfall in years. “They ended up with 12 inches from the storm,” Kruse said, which makes it the second-heaviest snowfall ever recorded at the park in a 24-hour period. The all-time record was set in 1894 when 15 inches of snow fell in a single day. Hardware Ranch opens tomorrow, Dec 13, for the 2013-14 season. 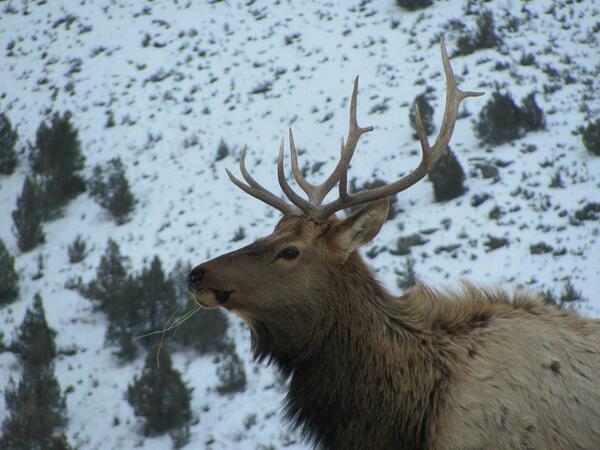 The annual Hardware Ranch Elk Festival will run Dec. 14 from 10 a.m. – 2 p.m. The ranch and festival offer great opportunity to view and photograph wild elk while enjoying sleigh rides and other winter activities. See the Hardware Ranch website for details. Hardware Ranch Wildlife Management Area is an important elk refuge operated by the Utah Department of Wildlife Resources. It is located in the mountains southeast of Logan. Elk congregate in the meadow at the ranch, where it is easy to see them. Large bulls can usually be found among the wintering animals. Surrounded by the fifth saltiest body of water in the world, Antelope Island sports no less than 40 natural springs that support an abundance of flora and fauna. Bison dot the snow and grass covered hills, mule deer flick their ears, native antelope play, and coyote howls carry on the crisp air. Porcupines slumber in trees lining the road to Garr Ranch while birds flit, soar, call and congregate. Nowhere else in Utah will you see such diverse wildlife so close to dense population. Bring your binoculars. Snow Canyon is one of my favorite winter hiking destinations and I enjoyed a trek there this afternoon. There was snow on top the sand - a somewhat rare site. I enjoyed seeing the white stuff drifted against red rock. Snow Canyon is a popular Utah State Park in the St George area. During a typical winter, 2-3 storms may leave light snow in the canyon. Warm temperatures usually return quickly and so the snow seldom lasts more than a day or two. But this is no typical winter. The area got blasted by heavy snow last weekend and we've seen chilly temperatures the past several days. Today it was close to 30 F when I hiked, and that felt warm. The forecast calls for a heat wave - afternoon temperatures should climb into the mid-40s as we move toward the weekend, and the snow will disappear. Typically, winter temperatures here will rise into the high 40s or low 50s many days. The snow enhances the dramatic scenery and creates a paradise for photographers. If you want to experience it, you should get down here during the next 2-3 days. The snow has generated quite a buzz. Zion Park released the video below showing some of its winter scenery and giving tips for exploring in the snow. KSL.com has this interesting feature: 5 reasons to visit Bryce Canyon in the winter. The annual Monument Valley Balloon Event will be December 13 – 15, 2013. It is always fun seeing colorful balloons behind the area's iconic rock towers. This year should be particularly good because there will probably still be snow in the area. Winter hit Utah hard over the weekend, with cold and snow blanketing the state. That includes Utah national parks that normally receive little or no snow. Now, we're seeing amazing photos of snow against red rock. A shot of Delicate Arch, in Arches National Park, illustrates this post. The photo was posted by the US Department of Interior. Heavy snow fell in Zion Canyon. Zion Park has posted this winter photo gallery on its Facebook page, including iconic formations frosted with snow and ice. Snow will melt quickly in many areas, so get here now if you want to see it. Bryce Canyon makes the list, along with Yellowstone and Grand Canyon. Below I give the snippet of information the article provided about Bryce Canyon, and then I add what I hope are additional insights. The otherworldly rock formations of Bryce Canyon draw more than 1 million visitors a year, most of whom come in droves every season except winter. However, the hoodoos—iconic red rock spires—look the most dramatic when topped by a heap of snow. Expect a chill, though the park's daytime temperature rarely drops below freezing thanks to its desert location. My comments: Bryce is incredibly beautiful during winter, and is well worth visiting. But expect very cold temperatures. Nighttime temps often fall to around zero F. During the day, the temperature gradually climbs and afternoons can be quite mild. But the cold returns quickly as soon as the sun drops low in the sky. Stormy days can be frigid. The Bryce Canyon Winter Festival will be held Feb 15-17, 2014. It offers a wonderful opportunity to see the park in its snowy glory, and to participate in many kinds of winter recreational activities. National Geographic has this interesting series that offers ideas for long weekends in famous adventure towns and gives insight from local "experts." The series begins with Park City, progresses to Moab and then describes other popular towns around the country. We all know tastes and expectations may vary from person to person, and so all might not agree with all insights, but everyone can learn from people who have been there and experienced the adventures. Below are a few excerpts form the reports on Utah towns. Read his recommendations on where to eat, where to stay and what other activities to try. Paddle: ...The “Daily” is the local favorite float ride, and can even be done on a stand-up paddleboard. Read here recommendations on where to eat, where to stay and what else to do. Utah's Ski resorts picked up big snow early this week and more is coming tomorrow and Sunday. Fresh powder always gets ski enthusiasts pumped up. But several new passes are also causing excitement this year. They provide discounts and the opportunity to ski multiple resorts. SkiUtah.com has details here. Below are excerpts. Day of Arrival Ticket Deal: Alta and Snowbirdare offering 50% off day tickets within 24 hours of arrival. The guest must register online before arrival. Big Cottonwood Pass: Brighton Resort and Solitude Mountain Resort have teamed up to introduce the Big Cottonwood Pass with access to over 3,700 acres of terrain, 130 plus trails and 15 lifts. The scenic SolBright trail connects the two resorts. Best Pass Benefit in the Wasatch: Alta, Deer Valley, Park City Mountain Resort and Snowbirdhave teamed up to offer season pass holders an exciting new benefit. Qualifying season pass holders at the 4 participating resorts can enjoy 3 days each of free lift access at each of the other three mountains. Epic Pass: Canyons Resort is Epic! Now under Vail Resorts management, Canyons Resort Epic Pass is only $709, with unlimited skiing and riding at Canyons, Vail, Beaver Creek, Breckenridge, Keystone, Arapahoe Basin, Eldora, Heavenly, Northstar and Kirkwood. Mountain Collective: For $379 those who join the Mountain Collective receive two free days and an unlimited 50% off lift tickets, plus exclusive lodging deals at each of six destinations: AltaSnowbird, Aspen/Snowmass, Jackson Hole, Mammoth Mountain, Squaw Valley/Alpine Meadows and Whistler Blackcomb. Powder Alliance: Snowbasin along with twelve mountains in the west have joined forces to create the Powder Alliance, offering three FREE days of skiing to pass holders from other participating Powder Alliance areas. These 12 mountains include Snowbasin Resort, Crested Butte, Sierra-at-Tahoe, Stevens Pass, Timberline, Schweitzer, China Peak, Mountain High, Arizona Snowbowl, Mt Hood Skibowl, Angel Fire Resort, and Bridger Bowl. The SkiUtah.com report also includes details about improvements at the resorts. It is worth reading in its entirety. Due to snow and poor road conditions the BLM's Vernal Field Office has canceled the Jarvie Winter Fest scheduled for Saturday, Dec. 7, 2013. Arches National Park closed the main park road briefly because of snow, but it is now open. Canyonlands provided this information: "The Island in the Sky road will be closed until plowed. Needles roads are open, but conditions leading there unknown." Parts of All American Highway 12 received heavy snow, as you can see in our photo. Sundance Ski Resort picked up 16 new inches. It will open Dec. 6. Deer Valley received 19 inches of new snow over the past 48 hours. It will open Dec. 7. Eagle Point Ski Resort (east of Beaver) received 8-10 inches. It is set to open Dec. 19. The storm missed extreme northern Utah. Beaver Mountain and Powder Mountain did not reporting any new. They are still determining when they will open. Wolf Mountain is scheduled to open Dec. 12. Now that the storm is winding down in most area, forecasters say temperatures will be very cold. Take care, especially if you are traveling. More than 800 beautifully decorated trees will be on display this week at the annual Festival of Trees, which will be held Dec 4-7 at South Towne Expo Center, in the greater Salt Lake City area. The event is a fundraiser for Primary Children's Hospital. This year's theme: "Gift of Love." For 43 years, the Festival of Trees has been a “Gift of Love” to children. The Festival is organized by a volunteer board of 85 women who enlist time and talents from thousands of individuals, organizations, businesses, and families throughout Utah and beyond. Over $33 million has been raised for children at Primary Children’s Hospital through the Festival since 1971, with $1,871,546.91 raised last year. There will be singers, dancers, and instrumentalists every day. I recently enjoyed a fun rock hounding trip to Fossil Mountain, in the Utah desert west of the town of Delta. 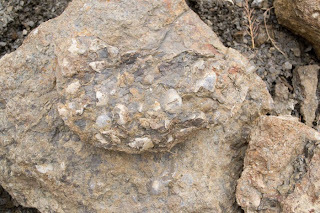 I escorted a gaggle of kids and they had great fun finding rocks full of small fossils that could include brachiopods, trilobites, echinoderms, cephalopods and other ancient creatures. 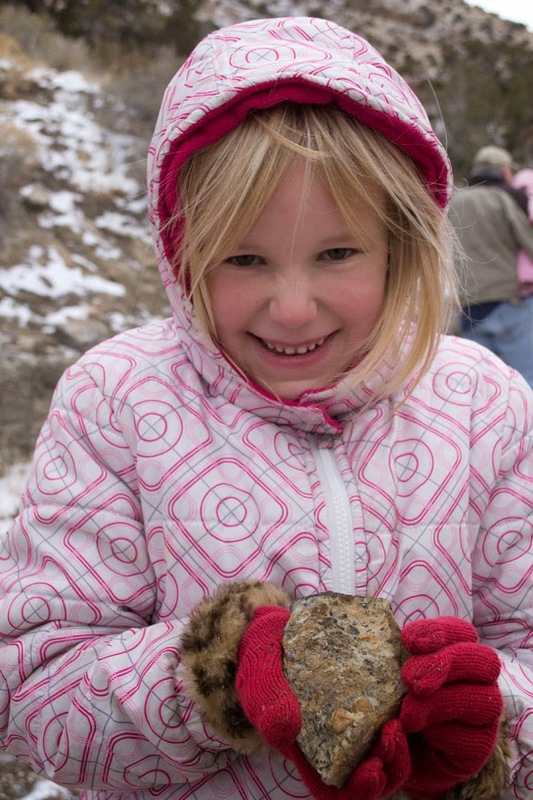 Winter is a great time to explore our vast west desert, which is a very popular area for rock hounding. The desert offers many minerals, semi-precious gems and interesting fossils. The trilobites found around Antelope Springs are one of the most popular attractions. 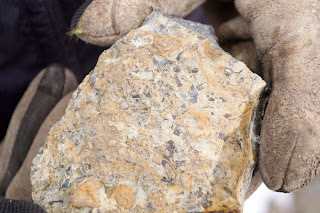 Topaz Mountain is another popular spot and topaz crystals are relatively easy to find on the mountain's slopes. Some are gem-quality. 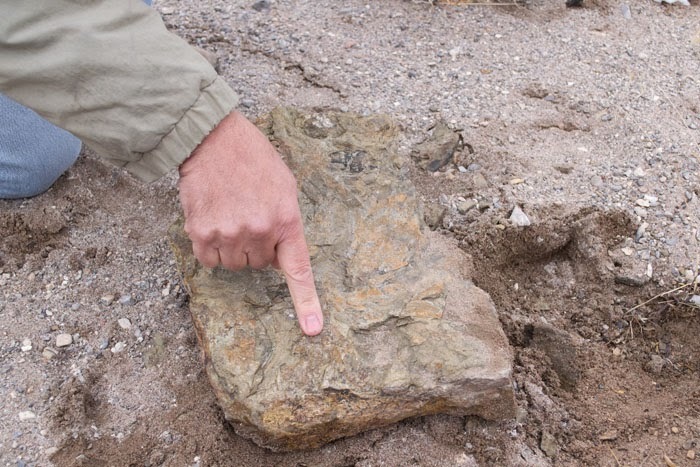 Read more about Utah rockhounding spots. The west desert includes flat plains but also many low mountain ranges that are covered by sage brush and juniper trees. Wildlife is abundant. Wild horses roam the range in many areas and have become a fun attraction. In the desert, winter days are often sunny with mild temperatures but nights can be very cold (down around zero at times during January). Snow falls occasionally but usually melts within a few days, so the rocks are usually exposed. The area is remote with few services. Major access is via Hwy 6/50, which is known as the "Grand Army of the Republic Highway. It is also know as the "Loneliest Road In America." There are no services along the highway for about 90 miles, from the Delta, Utah area west to the Great Basin National Park area (on the Utah/Nevada border). Dirt roads crisscross the desert. Some are graded but many are rough and may be impassible during stormy weather. To visit Fossil Mountain, follow the directions on this web page. A wash cuts across the north side of the mountain. If you have a high-clearance vehicle you can drive right to the wash at the base of the mountain. You can easily see the dark fossil-bearing rock where the road comes into the wash. If you hike a little you will find several other areas where that particular rock layer is exposed. At each of these spots it is easy to find fossils. From Salt Lake or Las Vegas it is possible to visit Fossil Mountain as a day trip. It's more fun to combine it with a visit to Great Basin National Park and make it an over night or multi-day adventure. I could wander for weeks in the west desert. I've explored many places there but still have many spots on my must-do list.